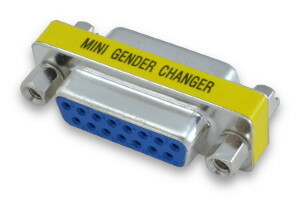 Use these handy adapters to connect two DB-15 connectors of the same gender. Choose from Male-Male or Female-Female varieties. The compact size of these adapters makes them ideal for tight spaces. All corresponding pins are connected: pin 1 to pin 1, pin 2 to pin 2, etc. Note: These adapters do not connect with the cables used with PC VGA monitor cables. Please see the DB15HD Mini Gender Changers for that application.